In the bucket list item I’m discussing today, I was going for repulsive, not merely undesirable, but after much research on the topic, undesirable is what I have had to settle for. It’s the *#&! deer, you understand. 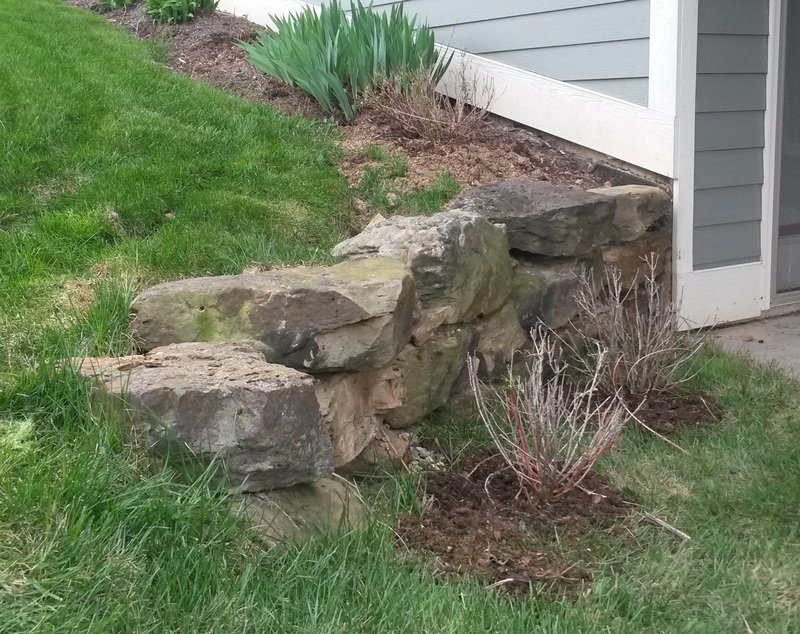 The LIST item is “plant a garden on at least one of our rock walls,” which is easier placed on a list than achieved, given not only our clayey soil but also the *#&! deer that tend to think everything we plant is a snack. This early spring I have spent much time researching plants that deer think taste like black licorice–i.e., repulsive. Many plant sellers use a cute little symbol of a deer in a red circle with a diagonal line through it. 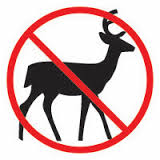 If deer were cute and read seed catalogs, they would get the message that this means “NO DEER!” However, the fine print is that deer will try almost everything if they are hungry or even just curious. Aaaargh! I have a poor little hydrangea plant that gamely comes up every year, and just as it is about to set a flower, the deer come by and strip every bud and leaf off of it. The *#&! deer should be the “game” ones, if you get my meaning! The other difficulty with planting on our rock walls is that both face north and don’t get much sun. I have not found a suitable trailing plant that I can plant in the shady rock niches. Every trailer seems to require sun, to be uncontrollably invasive (i.e., it would end up taking over the lawn), or to be deer food. 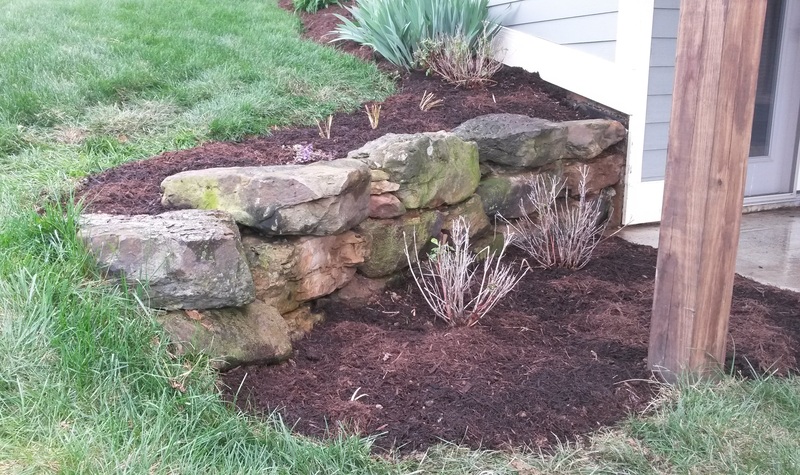 Not to be deterred, last week I planted new flowers and bushes above and below our two rock walls. On digging out the grass that formerly grew around the rocks, I discovered the extent of the ground slump that has been occurring above the walls. This is not surprising, given the newness of the house and all the excavating done around the foundation. Eight tons of rock slabs, though solid looking, still have crevices that will slowly continue to fill in from behind as the ground resettles. 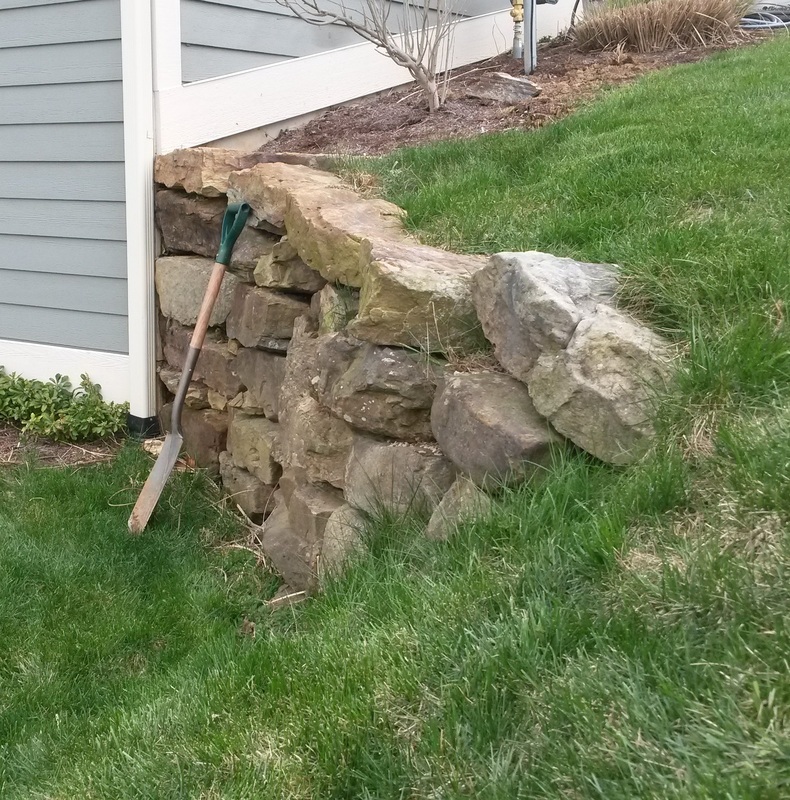 Hopefully the plants that I have put on the top of the walls will help stabilize the soil—and no longer needing to run the lawn mower directly on top of the walls should also help protect the rocks and the surrounding soil. The pictures show before and after views of the two rock walls. The large bushes (red twig dogwood) on the one side were gifts from my neighbor, who took them out of her garden because they were on the deer path and were too tasty. I have surrounded them with deer resistant (no such thing as deer proof) plants including bleeding hearts, widow’s tears, and liriope in hopes that will make them less attractive to deer and thus more attractive to this hopeful gardener. 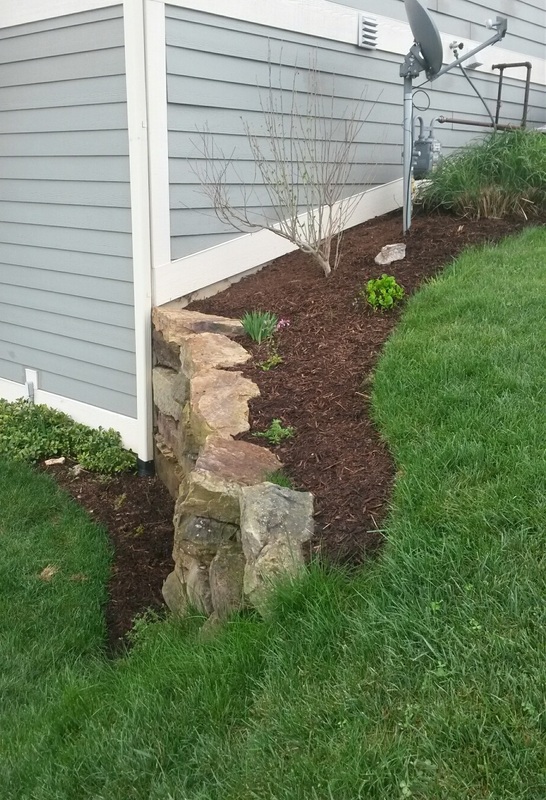 On the other side of the house, I have planted astilbe and lily of the valley on the shady side of the wall and phlox and soapwort above on the sunny side, all deer resistant. Still to be planted are creeping thyme, black-eyed susan vine, and foxgloves from seed, along with some annuals that I’ll put in to fill in the spaces until the perennials take off next year or the next. With fingers crossed, the final gardens will be indeed attractive—yet undesirable. Next Article Next Article: Visit Shiloh—Done!